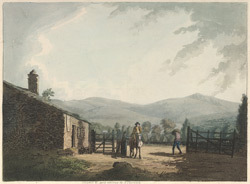 View of a turnpike near Keswick in Cumbria. It was very difficult to travel around northern England and the Lakes before the development of proper roads. In the 17th century roads were built but they were expensive and so a series of turnpikes were introduced to help pay for the roads. Turnstiles or gates were built across the roads and these were only raised or opened when the traveller had paid a toll. The money was used to build new roads and upkeep existing ones. These new roads encouraged tourists and travellers to visit the Lakes and Keswick, and they made trade and the transportation of goods much easier.